Is my avatar too short? I love ball gowns but when I put them on, the skirt is often much too long for my avatar. 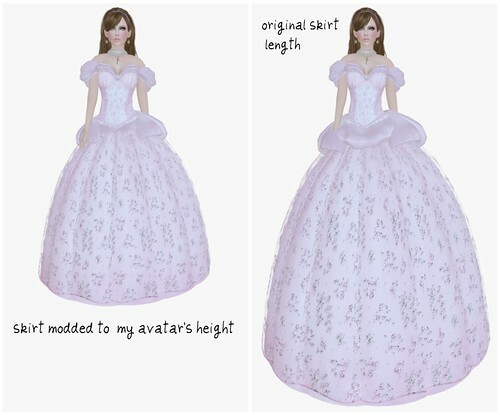 Is my avatar too short or are designers making these gowns for taller “model sizes”? The height script thing says my avatar is at 5’11 and even taller with heels on. My suggestion to dress makers: please make your skirts for Short and Tall avatars! Provide two lengths so I don’t have to mod the skirt myself. When I tried to resize the skirt for the gown I’m wearing here, the sculpted bustle disappeared into my torso, so I had to drag it forward and modify the bustle parts to fit. It’s not too complicated, but it would be nice if it just worked right out of the box, cos there are lots of people who would find this simple task difficult. This is why I don’t blog ball gowns more often, cos the skirt annoys me. A couple of brands are just my size, but some of them are made for avatars with Amazon proportions. P.S. I’m wearing the Nardcotix ‘Ella English Victorian Gown’, it’s very pretty! My friend Wilma saw me wearing this and asked if I was taking pics for a Disney ad, lol! Too short? No way! My avie is exactly 6′ and I think that’s plenty tall! I haven’t had this problem with clothes (except my wedding gown). My av is only 5’6, so I get comments all the time about how little I am. I notice it usually in certain poses. I guess I just prefer shorter skirted outfits. 5’11 is pretty average for women in SL, I think? I am about 5′ 8″ without heels on. I do find I am shorter than the average woman on SL. Sometimes, I have to mod clothing to fit me. That can be hard if the clothes do not have copy perms. I would much rather buy stuff on SL that is copy/mod no trans. I’ve long since resigned myself to ball gowns trailing about a foot or so under the ground, since most of my shapes are in the 5’4-5’7 range according to the script measure. Since the script measure is actually about 7 inches shorter than your avatar’s actual height, I think that’s plenty tall. But not by SL standards, obviously. But while more size options included with purchases would be nice, it would probably still only help a minority, so with all the options designers are expected to do I can see why they’d skip on that. A better way of resizing things would be the real solution. If it was possible to stretch or shrink linked prims in just one direction it would solve these kind of issues.